1 What is a DollarTune App and how does it work? 1.0.0.1 How to Use DollarTune App? 1.0.0.1.1 How to transfer reward money to your Paytm wallet? Are you looking for genuine apps for getting free Paytm cash rewards? Well, there are a few applications which do pay rewards to their users for completing their simple daily tasks. There are many such apps, like Skrilo Paytm cash rewarding app which really rewards real Paytm money for completing their daily tasks. If you haven’t used it yet, here’s the guide. 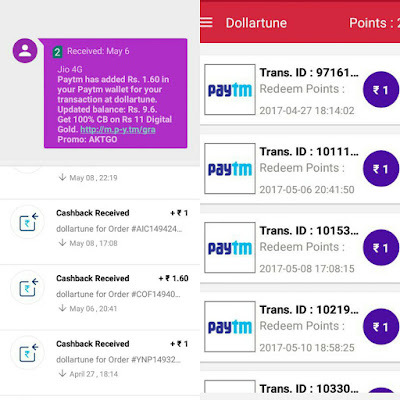 Similarly, today I will show you the best related Paytm money rewarding Android app called DollarTune App. This android app is very easy to use and it’s a kind of different from all other free recharge rewarding apps available on the Google PlayStore. Because unlike other apps, DollarTune allows you to transfer paytm cash into your Paytm wallet as soon as you accumulated rupee.1 whereas, other reward giving apps will never allow you to payout in this very amount. Normally other related apps allow you to transfer cash into your wallet as soon as you reach rupees 10 – 20. Before we proceed to the actual tutorial, there are a couple of things you should know first. What is a DollarTune App and how does it work? Dollartune is a great app that rewarded its users with Paytm Money for watching Ad’s and using the ringtone earning option. DollarTune works completely on users consent and the users engage with the brands of their choice. Depending upon the activity performed, you earn gratification points that can be redeemed instantly by Paytm. Dollartune is a genuine app and really pays to its members. Transferring cash reward to your Paytm wallet is very easy and super fast. It provides ad’s on a daily basis so that you can keep earning. It allows you to earn money by receiving calls on your android device using the ringtone feature. How to Use DollarTune App? 1. Whenever you will get ad’s, you will be notified on your phone. Then open the app & click on the ad. 2. After clicking on the ad, wait for a while to load the ad and then click on done & you successfully received 5 paise per ad. You have to watch all the ad they provide daily. The more you watch ad’s, the more money you earn’s. Another way to earn money is, keep DollarTune ringtone on your smartphone and whenever you receive someone’s call on your device, you get paid. In dual-sim devices, ringtone feature is working only on your default sim. DollarTune pays you Rs.5 paisa per ad you watch and Rs10 paisa per call you receives! So, your Fayde ki Ghanti starts ringing now! How to transfer reward money to your Paytm wallet? 1. To transfer your earned money, first of all, you need to create a Paytm account with the same number you have registered on DollarTune to get the immediate transfer. 2. After creating your paytm account you need to open the dollar tune app and go to reward section. 3. Now, click on the transfer button. Congratulations! You have received your dollar tune cash to your paytm wallet. Here’s the payment proof that I received from DollarTune app. By performing the above steps, you will successfully get free Paytm Cash daily. You will also get paid 10 paise per call you answer on your smartphone. 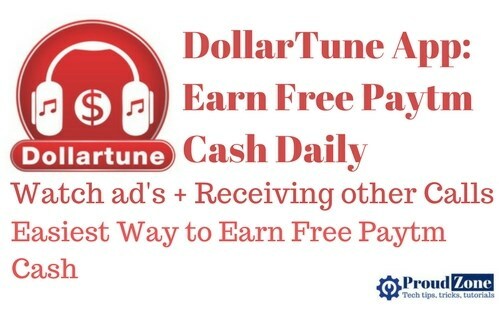 Not just that, DollarTune app also rewards its users for every activity. It is an application that helps you with cash whenever you shop, recharge your mobile or pay your bills online. Before making your first payout, you need to install Paytm wallet and you have to register with the same number you are using for Dollartune to get the immediate transfer. The maximum payout per day is Rupees5. So, by using this app you will be able to earn free paytm cash daily. Thank you for reading this article. If you like this post, do share with your friends & colleagues & also don’t forget to subscribe us now to get more tips and tricks directly into your inbox.